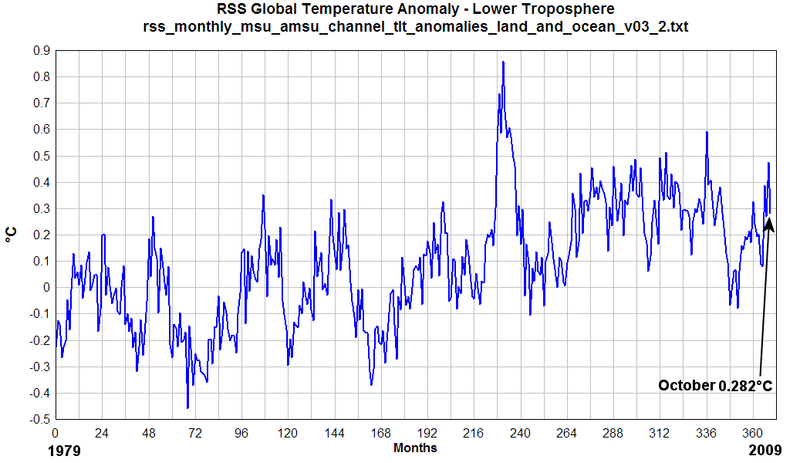 RSS Global Temperature out for October – down, nearly identical to UAH | Watts Up With That? The RSS (Remote Sensing Systems of Santa Rosa, CA) Microwave Sounder Unit (MSU) lower troposphere global temperature anomaly data for March 2009 was published yesterday and has dropped after peaking in January. The change from September with a value of 0.476°C to October’s 0.282°C is a (∆T) of -0.194°C. I spoke with Dr. Roy Spencer at the ICCC09 conference (3/10) and asked him about the data divergence. “I believe it has to do with the differences in how diurnal variation is tracked and adjusted for.” he said. I noted that Feburary was a month with large diurnal variations. It certainly looks like the data sets are converged now, with a scant difference between UAH and RSS in October of .002°C and that Dr. Spencer was right. Read the details on the October UAH data here. November 8, 2009 in Climate data. It must have been ridiculously cold all the time in the good old days. With 100 year old cold records set seemingly everywhere, what does it take to get a negative anomoly? Probably cooling ocean. Most of the satellite global temperature measurement is over ocean. Yeah, if that’s GW, who needs cooling? Interresting to note is that looking at RSS, the linear trend since 1979 is app. +0,27 or maybe +0,3 at maximum. The linear trend since 2002 is however app. -0,185. Quite a part of the rise since 1979 is already eradicated. We had to trudge five miles to school through three-foot snowdrifts. It is interesting that October showed a marked increase in Cosmic Radiation [see NASA Ace spacecraft results] Henrick Svensmark et al has shown a good relationship between these rays and lower cloud formation which in turn increases Albedo and hence cooling. 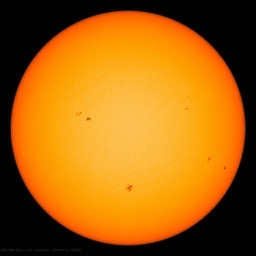 The sunspot count relationship however is not so clear, due probably to galactic ray anomalies; but hopefully the CERN project [ On stream 2010?] in this area of research will prove valuable and eventually put the CO2 fetish into perspective. By such anomolalic measures as seen today with 100 yr. cold records littered about like failed lottery tickets, the Little Ice Age would be a cool jaunt to the beach in a sweltering summer heat wave. Keep in mind that sunspot counts are a non-linear affair. I’ll trade you 50 pennies for 50 quarters any day. We both get 50 coins, right? “We had to trudge five miles to school through three-foot snowdrifts. Well, it wasn’t too hot on the eastern seaboard (Inner west Sydney, 25c) of Australia today. We are inline for “normal” temperatures for the w/e…which will be good for a change. I just got a text message from a friend in the UK, Brighton area. She says it’s a bright, cold, crisp morning. Sounds like the ’70’s all over again. check out this pool’s results, even with the massive propaganda on the danger of Global Warming almost 50% of the people do not believe that! It must mean something! for the science is settled. Another sign of accelerating rate of climate change, worse than scientific predictions. Alas, with minus sign. I’ll trade you 50 pennies for 50 quarters any day. We both get 50 coins, right? Make them 1909 Lincoln DVB and you’ve got a deal. Are the sat temps calibrated off the surface temps and if so how often and where? Can anyone tell me, what is the difference between UAH and RSS? Are they both satellite, or satellite and radiosonde or what? Holland October 2009: 10.7° C (1971-2000: 10.3° C), normal precipitation (but not in distribution over the country), a bit more sunshine than average. Ninth consecutive positive anomaly month for 2009. This is all good news…but not relevant to this post – apologies. I am an aging engineer and I am prepared to state categorically that global temperature and GT anomalies cannot be determined with a precision better than ±0.5°C. Even that is a bit of a stretch. You might be able to establish an anomaly for an unchanging, well-maintained and routinely calibrated network of global stations with a precision of ±0.5°C. We don’t have such a network so maybe the precision of the measurement network is ±1°C. Is this network representative of global conditions? I don’t know and neither does anyone else. It is equally certain that indirect temperature measurement by satellite cannot be any more precise. One thing for sure is that we cannot say what is the GT anomaly with better than ±1°C precision. The best we can deduce from the instrument/satellite record is that Oct 2009 might have been a little bit warmer than the recent average, but we can’t say for sure. Few people these days, including scientists and engineers, have any concept of orders of accuracy. Bill – did you have to do it barefoot like us? Sat temps measure lower troposhpere. So, no, sat temps can’t be calibrated with surface temps. It would be appropriate to compare temps to weather baloon readings, but I could not find an answer to how often, if ever, they calibrate the temperatures. That is an excellent question, and from what records? E. M. Smith is in the process of demonstrating that the GHCN has been biased upward by thermometer selection bias. If GHCN data has been used, as it is in GIStemp, and I suspect in Hadley (prior to the dog eating Phil Jones’ homework) than an adjustment is in order, one that will have people calling for some perp walks. It struck me today that the UAH data is reported to 3 significant figures after the decimal point. Leaving aside the dubious siting of weather stations, I find it hard to believe UAH thermometers are precise to one thousandth of a degree. Am I right or wrong? Climatology is not my field of science. However, I had it hammered into me that I should always look out for significant figure abuse, especially for false precision. I noticed the COI artic temperature just dipped back to the average after spending a couple of months well above average. Does the modest El Nino warm the Tropics and then the heat spread nothward warming the artic until it dissipates? It would be interesting to know if we can track the heat moving through the system in a similar way that we would track a storm system or current. I’ll speculate that once we see the EL Nino fade we’ll see the anomoly back down to zero in the coming months. I say cool winter ahead. You forgot the bare feet, the broken glass, and the packs of ravenous weasels. What follows is a general theory of natural climate variation supported by observation of the changing temperature of the atmosphere and the sea between 1948 and September 2009. This work suggests that strong warming after 1978 is an entirely natural phenomenon. Between 1948 and 1976 the tropics and the globe as a whole was fairly stable in temperature with obvious cooling discernable in the decade prior to 1976. From 1977 through to 2000 the tropics and the globe warmed. By comparing data from the earlier period with that for the later period one can discern change in the atmosphere that resulted in more solar radiation reaching the surface of the earth causing it to warm. Atmospheric conditions in the near earth environment are strongly influenced by the sun. The observed warming of the last decades of the twentieth century can be attributed to natural influences. There is no evidence of any warming signature due to the increased presence of so called ‘greenhouses gases’. It is suggested that the greenhouse hypothesis takes little cognizance of the manner in which the atmosphere actually functions. The atmosphere cools the planet but a change in its temperature causes a change in ice crystal density and the quantum of radiation reaching the surface. Climatic models suggest that any greenhouse effect should be strongest in the tropical upper troposphere where water vapor is in higher concentration. In point of fact warming of the upper troposphere at the equator is less likely as the globe warms because the quantum of outgoing radiation diminishes as convection and de-compressive cooling is enhanced. It is in the subtropics that outgoing long wave radiation increases and in particular in the high pressure cells where the air is descending and warming and the sky tends to be cloud -free both in terms of liquid and ice crystal density. A water vapor feedback mechanism would require an increase in specific humidity levels in these high pressure areas. The reverse is observed. If a greenhouse effect were present it would be unamplified and tiny. Any warming tendency in these areas is more likely to be due to a loss of ice cloud density than a greenhouse effect. If the Earth enters a period of cooling, as it has since 1998, it suggests that the natural factor is pre-eminent. If there is a strong relationship between ice cloud density and surface temperature it confirms the point that moisture in the upper troposphere cools rather than warms the planet and the basis of the greenhouse feedback mechanism is negated. Without a water vapor amplifier a change in so called ‘greenhouse gas’ levels can have little or no effect upon surface temperature. Haha….as usual the NAO is the most stubborn to resist, evidenced by that Monsters vs. Aliens giant blob of anticyclone over the SW Atlantic that keeps springing up. The latest balmy GFS run sure reflects this ho hum as well, as well as the fire-hose jet flooding the country with Pacific Air. Which will win the battle this month? The cold or the warm? In time….the cold will ooze south, a heavy, (and rather slow) but unstoppable monstrosity. I am really hoping for some coast to coast cold this year as I want to see good snowpack for the Olympics and some good snowstorms to greet AL GORE wherever he speaks! We didn’t have to walk five miles through snowdrifts to get home – we didn’t have a home. We had to sleep on’t factory floor and eat oily rags. We were lucky…..
March should be October and January should be September? Yes, but you always were late. Global SST anomalies rose 0.047 deg C between September and October, with all but the Arctic and Southern Oceans showing increases. The equatorial Pacific is now showing signs of moderate El Nino conditions (Monthly NINO3.4 SST Anomaly = +1.04 deg C and Weekly NINO3.4 SST Anomaly = +1.66 deg C). Monthly NINO3.4 SST anomalies rose +0.208 in October, while the weekly data shows NINO3.4 SST anomalies have been increasing rapidly over the past few weeks. WILSON TUCKEY, LIBERAL MP, WA: Leave me will you, I’m going to the toilet. BOB CARTER: I don’t have a message. I’m a scientist. I work in the area of climate change. And as a scientist I don’t have an opinion, I don’t have a political view. SARAH FERGUSON: For someone without a political view, Carter comes across as a political activist. Yes, and once that heat is “lost” it must build back up again. It isn’t hiding in a cave somewhere being “masked” by something, it is just flat gone; radiated into space. But I would caution that with the caveat that regional ocean differences can have a large impact on the “global average” such as a large el nino. You can see the large impact in the graph from one such event in the past. The problem with “global averages” is that they can be misleading. Imagine you have a room with 20 people and the mean height of the occupants is 6 feet. Now take one person out, put in a different person who is 7.5 feet tall. Now the “average height” just went up but 19 of those people are still exactly the same height as they were before. They didn’t change but the “global height” went up. The reporting of global averages misleads people into thinking that the temperature where they live (no matter where they live) has risen when that may not be the case at all. Then add the problem of removing rural stations from the reporting grid (in this analogy, remove all people from the room under 6 feet tall) and you have an increasing “global mean” that does not reflect any actual change in temperature. In the case of the analogy, removing all of the people under 6 feet tall raises the “global mean height” but nobody is any taller than they were before. Removing rural stations from the global average increases that average value but no station is any warmer than it was before. It is misleading. The mean temperature of the continental US has dropped at a rate of almost 1 degree/decade over the past 11 years. That is using a network that has remained (relatively) static over that period. Other networks have seen a reduction of rural reporting stations over that time, particularly in South America and Africa. That’s probably quite correct. I don’t imagine the oceans absorb much heat from the atmosphere. I guess the transfer is the other way around. It is? Call me an idjeet, but wouldn’t be anomaly be ~zero in this case? (notwithstanding the fact that given the accuracy with which we can measure these things, 0.282 is ~0!). Yes I always hated those weasel attacks but at least they did not come out much when the wind was blowing 60 mph (a head wind in both directions). One interesting thing I have been thinking about the last few days. Given that there is still lots of open water in the Arcitc, would it be fair to say that the earth is dumping a lot of heat to space from that open water right now? If it was frozen over the net heat flow would be significantly lower. I am assuming that ocean currents are still carrying warm water well up north to keep that water clear at prevailing air temps. If so the heat input to accomplish that would have to be quite substantial, and now that the sun angles are very low the difference in albedo between open water and ice would not be all that significant, given surface reflection off the water at low angles of incidence. The effects of Ida sucking heat out of the Caribbean ocean and the North Atlantic this late in the season, will also lead to cooler SST’s along the gulf and Atlantic coasts as we enter winter. I wonder if anyone has some historical examples of the weather that followed in the eastern U.S. following seasons where we had late season tropical storms/hurricanes like Ida. Hurricane Ida is already starting to weaken due to low SST’s and has dropped to a cat 1 last I looked. As always…great insight and bulletproof words. Very much like my upbringing . . . of course you were lucky. We had to crawl through six feet drifts, start work before we got out of bed and had cold poison for lunch. You tell that to kids these days and no one believes you . . .
And you forgot that was trudging backwards against a 35 MPH wind, blowing snow, and ground (b)lizards not weasels. I am not so sure it is clouds formed by cosmic rays that keep the oceans from warming from a steady Sun beam. I think the operative word here is “and”. If the winds kick up, salt water spray is in the air. Evaporation may be heightened at the beginning. Water vapor forms. Clouds form. The Sun’s rays are deflected. Very little warming happens under the skin of the ocean. Temps cool. As long as the wind keeps the oceans churning around the equatorial belt, these conditions, or at least some of them, should persist, leading to further cooling. When the winds die down, the doldrums set it. The Sun’s rays are no longer reflected and are thus allowed to penetrate deeply into a calm ocean surface. Things heat up. Cosmic rays may be involved but I question to what degree. As I question anthropogenic CO2 and methane. And sunspot numbers, and flares. I think the variable Earth is quite capable of burying these smaller sources of heating up or cooling down. Relatively speaking regarding natural forcing up or down, I think external sources of variability are small, very small, compared to internal sources of variability. My mother would make the same statement when one of the kids would complain about the cold or the snow. How she got through such deep snow when she was only 3 feet tall was always a puzzle. She often bundled us up so much we dared not fall over or we couldn’t get up without help. After a certain age the current temperature extreme only reminds you of an earlier one – it is not something new. Anthony, where has the ‘tips and ideas’ gone? Have you seen the Indian report about the Himalayan glaciers? Vincent (03:51:22) UAH and RSS ? Roy Spencer wrote about the differences in a blog on his site a few months ago. My simple search of his site did not yield anything but if you do a Google search with “difference between UAH and RSS” you will find several comments. I think Pen Hadow endured much more than you lot in search of an education. And he hasn’t learned yet. Actually, it would be interesting to do a statistical analysis to see how much memory global surface temperatures have. For example, it’s been shown that stock prices are essentially memoryless. If a stock closes at $20 today, you can make a decent guess about it’s price tomorrow. But that guess will not be any better if you know that the stock was trading at $19 yesterday and $18 the day before. My instinct is that global surface temperatures are a good deal more memoryless than most folks give credit for. I have been comparing this El Nino to previous El Nino’s, especially the big one. If I were a ship with sails as my only mode of movement, I would have been stuck in the doldrums from 1997 to fall of 98. The amount of ocean heating created quite a thick belt of equatorial warm water that just sat there. But once the trade winds picked up, man did they blow, and the water was friggin COLD under that warm surface that was blown away. Under the present El Nino, some east to west wind is still blowing. Which is why we aren’t getting that thick equatorial band of warm water we got previously in the 97-98 El Nino. Also, sea surface temperatures are not a good proxy for air temperature or ocean heat content. They are a proxy for wind speed. You have water with air that is 25C and still (no wind) over it. Measure the temperature of the water at the surface and at 10 meters depth. Now increase the wind speed to 3 meters/sec and measure the ocean temperature again. You will find the surface temperature has dropped but the temperature at 10 meters is the same. The air very close to the ocean surface is also a little cooler but the air at 100 feet is still 25C. A place in an increased sea surface temperature anomaly is generally more reflective of a change in wind speed and/or direction than it is a reflection of heat in the system. Show me a place with a high sea surface temperature anomaly and I will show you a place with a wind anomaly. Cover the bulb of a thermometer with wet gauze in still air. Record the temperature. Now turn on a fan and blow air on the gauze and note the temperature drop. Fill a bathtub with water. Place one thermometer at the bottom of the tub, place another at the surface and one more in the bathroom in air. Allow them to sit for 24 hours and record the temperatures. Turn on a fan so that it blows across the surface of the tub near the surface thermometer. After 10 minutes, record the temperature again. You will likely note a decrease in temperature on the surface thermometer, no change in the one at the bottom of the tub, and no change in the one in the air of the bathroom. Sea surface temperatures are important for storms because storms operate on convection. The greater the difference between the temperature at the surface and the temperature at altitude, the stronger the storm intensification. This is why storms at sea strengthen at night and storms on land strengthen in the day. At sea, the water is about the same temperature both day and night but the air aloft is cooler at night and the cloud tops are not warmed by the sun. This greater difference between surface temperature and the temperature aloft causes increased convection. On land, the surface is warmer in the day. In some places this difference may be 20F to 40F warmer. The difference in daytime surface temperature is greater than the difference in the nighttime temperature aloft. As the land heats up, the air begins to convect and by afternoon, storms begin to appear. As a general rule, after the sun sets, the land begins to cool and as the cooling progresses through the evening the air becomes more stable and storms decrease in strength and dissipate. The preceding does not apply to storms caused by the interface of two air masses of greatly different temperature. It isn’t the absolute temperature that matters so much as it is the DIFFERENCE in temperature between the ground and the cloud tops. So it isn’t the fact that the sea surface temperature is high so much as it is that the temperature aloft tends to be more stable year on year. The temperature at 50,000 feet is likely to be pretty much the same this year as it was last year. But the surface temperature can vary greatly from one year to the next and when you have lower trade winds and higher surface temperature, you get greater convection and stronger storms. Looking at that graph, I’m struck by a couple of things: The range is from .9 to -.5 C, and the data shows great variation with detail within that narrow range (just barely 1.4 degrees in total). If anyone thinks that temperature data is gathered with that amount of precision, they are crazy. Classic example of the output of a bunch of data manipulation steps resulting in greater precision than the output steps – i.e. it’s just noise. I took the liberty of taking that graph and mashing it down into the context of the temperature range of the place I live – Saskatoon, Saskatchewan. It can get as hot as plus 40 C in the summer, and as cold as -40 C in the winter here. We are going to have to watch the El Nino very closely for awhile now. There are some significant changes happening. Equatorial Upper Ocean Temperature Anomaly moved into Super-El Nino territory in the last week. Correlation with this and the ENSO over time. The latest SST anomaly animation shows there was considerable movement of Pacific Warm Pool water backwards into the ENSO region in the last few days. The Trade Winds have been very weak and going west-to-east in some cases lately but then they jumped back the other way to very high levels in the last few days. So, we’ll have to see. I dont get that, if we are measuring here what are October anomalies above the 70-90 October norm, then about half of the anomalies should of been positive. But already beaten by mr. White. And a quick look at UAH shows that temperature at 56,000 feet varies about 1/2 of a degree F year-round. Temperature at 56,000 feet is currently about 2 degrees F below the 20 year average. That means that we might see stronger storms IF they get strong enough for cloud tops to reach that altitude. This would not be due to surface warming but due to high altitude COOLING. This makes the temperature difference between surface and altitude greater which drives more convection. Dropping down to 46,000 feet, temperature varies about 1 degree F over the course of the year (that is much less than the surface varies). Down at 36,000 feet we see about a 2 degree F variation over the course of the year and temperatures have varied less than 1 degree F over the past several years. So my initial “gut instinct” is that all things being equal, we should see about the same number of moderate sized storms but once a storm gets “big” and its cloud tops pass 55,000 feet or so, they are probably stronger than they were 20 years ago because temperatures at that altitude are now colder than they were allowing more updraft. I can’t help but wonder if solar activity has an impact on temperatures at >55,000 feet altitude. If you look at the atmosphere as a refrigeration system with water as the working fluid, the sea surface is the “evaporator” and the air aloft is the “condenser”. Like any other radiator, if the condenser is in a colder ambient temperature, more heat can be radiated away. If air temperatures aloft are colder above 55K feet, then storms reaching that altitude might be radiating more heat to space than they were. The significant drop from the average appears to have really started in earnest in 2005 when temperatures at 56,000 feet were some 1.5 degrees below “average” according to UAH. This is when we had a lot of large storms (Katrina, etc) as we had a weak Bermuda High allowing high surface temperatures combined with colder air aloft. Temperatures at 56K feet at about the time of Katrina were about 1F below average. As convection operates by a difference in temperature, decreasing temperature at altitude is the same as increasing temperature at the surface; doing either one increases the difference and results in greater convection. As there has been no great change from the long term average for temperatures at middle altitudes, I would expect the number of storms to be unchanged or reduced as temperatures in the lower troposphere are slightly warmer, it might be more difficult for storms to “get started”. But once they do grow beyond 50,000 feet, maybe they are stronger than they used to be. So … fewer strong storms but the ones we do get being stronger. So my curiosity would be to see if that is backed up with any real data. Fewer storms overall but the big storms being more powerful than, say, 15-20 years ago is what I might look for. Gotta remember — it’s only ~30 yrs data. We don’t know what sat-based temps would have been if they were observing during the whole 20th century — might have been surprisingly close in 1900 to today’s temps. Or not. Comparing station-based records w/sat is apples & oranges. I think looking at the graph, since 1979 there is a clear warming trend in the last 20 or so years , but the trend is not huge. The first years since 1979 saw either a stationary or a drop in temperature— this would be when many industrial countrys would have been producing huge amounts of CO2. Later on there is a clear warming pattern , but still the increase is very small– far less than you could programme a domestic air conditioning or heating unit to be sensitive to. Whilst any given measurements are subject to error mutiple measurements tend to flatten out this problem– especially when taken over many different locations. That said if the programme has been adjusted to include a certain bias this could produce trends etc. Best guess is CO2 has a very small effect and not worth spending trillions on to correct. Far better to put this money into fusion research which could in the future provide us with cheap clean energy from a totally renwable source. If we start working and spending hard with this goal in mind we could get there. Just a funny note about a weather report on a Sydney TV station run on the 9th November. They state that this is the hottest November in 100 years…and they can be sure of that by the 9th! This new breed of astrologer/meteorologists and their supercomputers are certainly earning their keep. No mention of the coldest Sydney October in 17 years though. It’s a funny remark about the old days being colder. BUT!!!! As a kid in the 50s I would look at photographs from around 1900 taken in my hometown on the Connecticut River. There were pictures of grandstands filled with people watching horse races on the frozen river. The river rarely froze over when I was a kid. But 50 years early they held carnivals and horse races on it. I would think we would need some very cold temps to approximate those days. Wait, we could have another Super-El Nino? “Polar bears are in decline, alright, but not everywhere*. (H/T TORedStar)”. For more AGW “insight”, go here*. OTTAWA — Canadian air force paratroopers on Monday rescued a teenager adrift overnight on an Arctic ice floe and threatened by polar bears, an official told AFP. The 17-year-old boy and an older friend had been hunting near Coral Harbor, Nunavut when they became separated and lost on Sunday. The teen, who was not immediately identified, was rescued Monday after a night in frigid temperatures with two polar bears on an ice floe that drifted into the Arctic Ocean, said Captain Michael Young. “This young man had quite a journey,” Young said by telephone from the Joint Rescue Co-ordination Centre at Canadian Forces Base Trenton, in Ontario. Assuming the trades get stronger and pushes the warmer water back to the west we could see these anomalies disappear, as you see it doesn’t neccesarily show a profile where you have warmer water below cooler water. We may need new terms, like the temp. gradient changing so it appears you have positive anomalies working their way up, even though it’s not warmer water below cooler water. Seeing this map before I’ve seen positive anomalies go down in place without getting to the surface because of these gradient changes. If the trades start pushing back the slope of the thermocline to the west those anomalies may start going down in place. Also, sea surface temperatures are not a good proxy for air temperature or ocean heat content. I disagree; SST copies HadCRUT or UAH pretty well and gives hint 1-4 months earlier where the air temperatures will go. I am an aging engineer and I am prepared to state categorically that global temperature and GT anomalies cannot be determined with a precision better than ±0.5°C. Even that is a bit of a stretch…..Few people these days, including scientists and engineers, have any concept of orders of accuracy. I definitely agree. I’m often driven to tear out what little hair I have left by the casual acceptance, even here among those who seemingly realize what a crock this all is, of the tacit assumption that because all this nonsense is offered up with numbers indicating dazzling precision, that precision somehow supports similar levels of inherent accuracy. We get global temps quoted to a thousandth of a degree, sea levels quoted to a tenth of a millimeter, climate proxies constructed by folks contemplating their samples of mud, ice, rock, tree rings, or whatever other variety of planetary detritus they can come up with, all artfully graphed with dramatic gyrations all plotted to a hundredth of a degree. In response, we engage in endless arguments about whether or not they have properly applied the appropriate statistical jiggery-pokery to achieve their results while completely ignoring the rather obvious point that, although our scientific technology has advanced tremendously in recent decades, it is still miles away from being able to reliably produce data with this kind of accuracy. Warm Ocean cold Airmass,I have a weather eye on that Polar jet..
Well, yes and no. I mean, it really depends on more than just the temperature at the very surface. Now if generally warmer water moves into an area, yes, the surface will be warmer for a given wind speed. But by the same token, for a given water temperature the surface temperature will vary with wind speed. So it is a combination both. But more generally speaking, if I see a large area of above normal surface temperatures in the tropics, it is a VERY good indication that something abnormal is going on with the trade winds. When you have weaker pressure gradients, you have higher surface temperatures but variations in the temperature of the entire water column will change surface temperature, too. To put it another way, if I raise the temperature of the water in that bathtub I used above by 1 degree, then the surface temperature will go up one degree. But if I don’t warm the water and simply decrease the speed of the fan blowing on it, the temperature will also go up a degree. Changes in wind speed happen much more often and at a faster pace than changes in the temperature of the entire amount of water at depth. Yes currents vary somewhat and meander a bit but it is difficult to get that much water to change its temperature over the course of a month. Wind can do it in a day. ARGO has noted practically no global ocean temperature change over a period of several years yet surface temperatures can change dramatically. The temp. is dropping despite the El Nino – it is still going isn’t it? Imagine the drop when El Nino decides to disappear, just in time for any UN ETS discussions next year. Another normal year for US temperatures. The entire Homogenic Global Warming scenario – for and against – is overwhelmingly based on Computer Modeling, with very tweakable spreadsheets. And as we all know ‘Put rubbish in and get rubish out’. I too enjoyed that parody.